The dark or hidden realm can be scary to some of us. Others revel in it and dive into it. We are going to look at it as fertile ground. 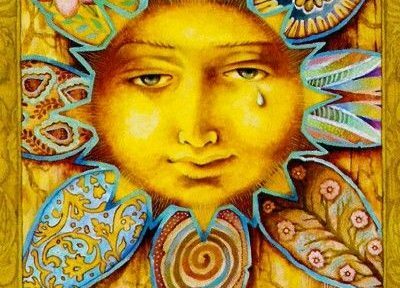 Seeds need dark time before they sprout. Many alcoholic beverages require a waitng time before they are drinkable. So too do we humans require quiet times for recharging. So here is a spread to help you with your recharging needs. What part of me needs recharging the most? How can I make time for the quiet that I need? What is my best way of honoring this time of recharging? We invite you to do this spread then leave your thoughts in the comments. We would love to hear from you! This entry was posted in Esoterica on December 21, 2016 by USGS Staff. 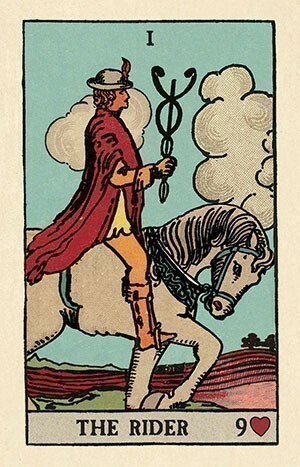 It’s time for the Tarot Blog Hop again. This time our wrangler is Louise Underhill. She’s challenged us to ask our ancestors for advice for the coming year. Since we are a company rather than an individual, we thought we would ask Pixie to help us out here. 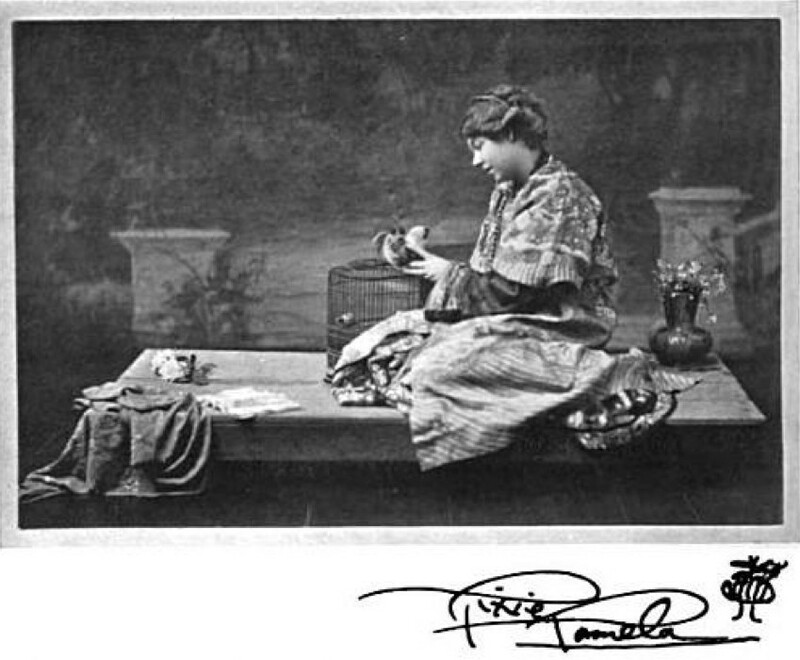 Pixie aka Pamela Colman Smith was the underserved artist of the Rider Waite Tarot. 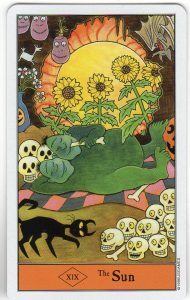 Many now refer to that deck as the Rider Waite Smith Tarot to honor her. We hold her in high regards here. We decide to honor Pixie by showing off the Pamela Colman Smith Commemorative Tarot as well as Pixie’s Astounding Lenormand. Her work graced many books including Bram Stoker’s last novel, The Lair of the White Worm. 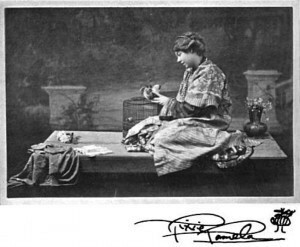 Her cousin, William Gillette (known for his work acting as Sherlock Holmes), collected some of her work. You can see them at his home, his castle actually, in Connecticut. Here are some images from the Commemorative set. 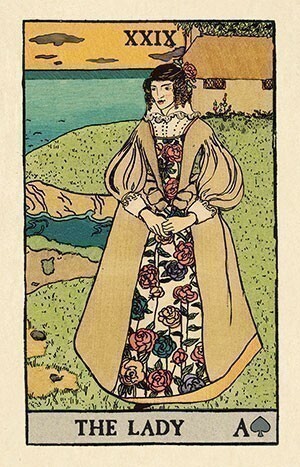 Next images from Pixe’s Astounding Lenormand. 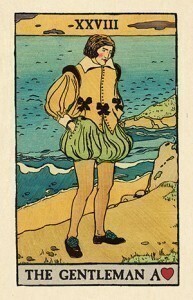 This features images found in the Smith-Waite® Tarot deck and “The Golden Vanity”. 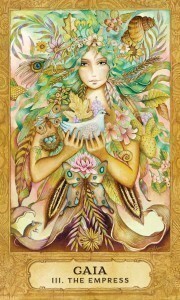 Thank you so much for joining us on yet another Tarot Blog Hop. We hope you find treats as you continue to hop your way through. 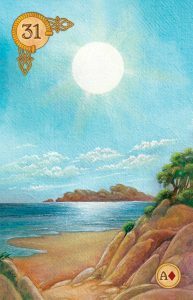 This entry was posted in Authors and Artists, Decks, The Cards and tagged lenormand, Pamela Colman Smith, pamela colman smith commemorative set, Pixie, Pixie's Astounding Lenormand on October 31, 2016 by USGS Staff. Our wranglers for this Blog Hop are Jay and Arwen. 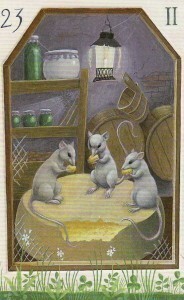 They have asked us to discuss the Foodies Guide To The Tarot. Wouldn’t that be a fantastic book? 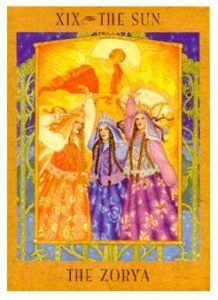 Since we don’t have that book, we thought we would discuss how the Tarot and food can go hand in hand. Among the many ideas we had, we landed on this one. 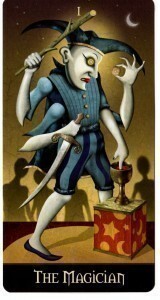 What would the Fool serve if he were giving a party? Dessert first, of course. There is even a dish named in his honor. 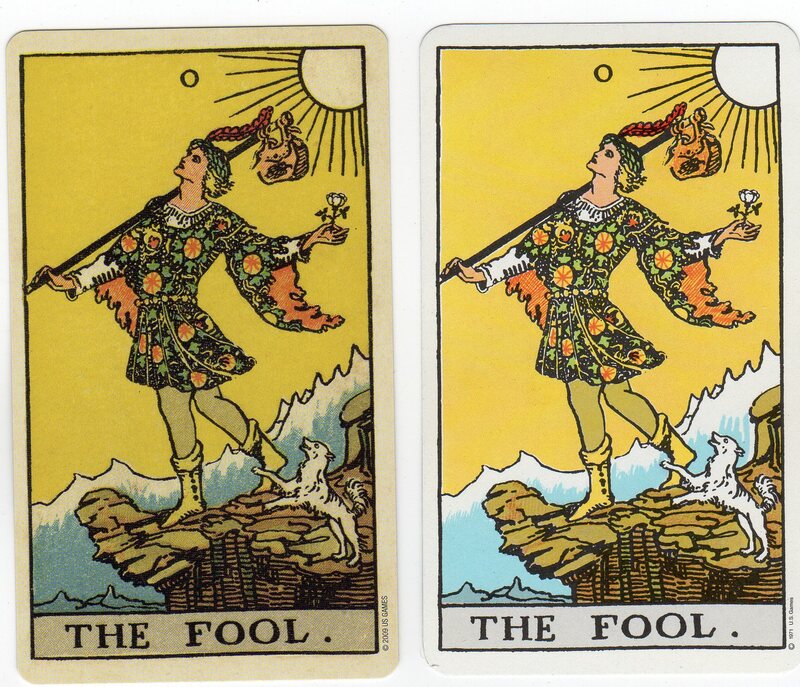 Well, okay, it’s called a Fool. Research tells us that it is an English dish made of stewed fruit and custard. It seems the appropriate thing now would be to offer up a spread…err recipe. We don’t have any recipes of our own so we will offer a link to the BBC Food website’s Gooseberry Fool. But we did want you to also have a spread to eat…err read. The Fruit: What is sweet right now? The Custard: What needs to be prepared? The Dish: What holds your energy right now? We hope that this simple spread, like this simple recipe, offers you some insight into your life. Feel free to let us know your results! And if you make the recipe, we are happy to come help you eat it. 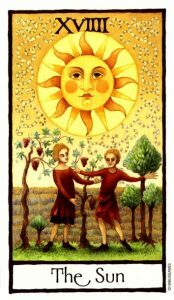 This entry was posted in Esoterica and tagged Archetype, Fool, Mabon, Tarot Blog Hop, TarotBlogHop on September 23, 2016 by USGS Staff. 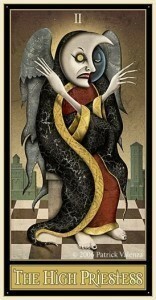 PREVIOUS : MASTER LIST : NEXTWelcome to the Tarot Blog Hop. We are so glad to once again be a part of this fun effort. 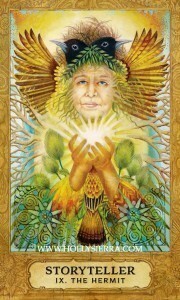 Our TarotBlogHop mistress is Aisling. 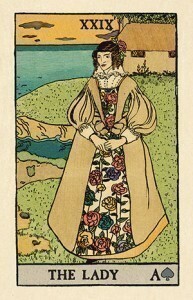 She gave us the topic of “union of opposites” asking us to share how two disparate cards might be similar. She gave us two choices but that’s the one we chose. The Devil and Temperance are our choice for this discussion. 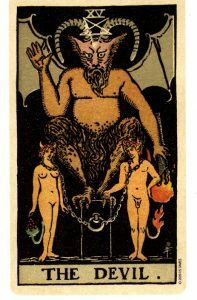 The Devil is often seen as a card that show power over others. The two figures on the chains that are bound to the Devil’s on waist–who are they? How do they relate to the Devil? 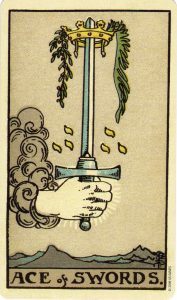 How can this card be seen as a union of opposites with Temperance. 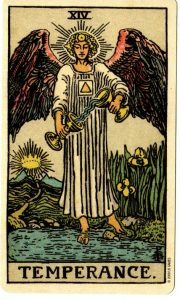 Consider that Temperance pours one energy into another changing it mid stream. 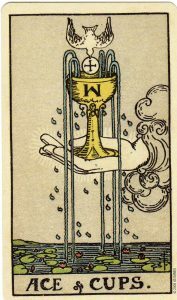 Or do those two disparate energies actually emerge from Temperance’s hands to combine in the middle? Could that be the Yin of the Female and the Yang of the Male perhaps? Could Temperance’s hands be the transformed chains and Temperance herself the embodiment of balanced power? Here is a simple spread for you to try with this in mind. How do I break free? 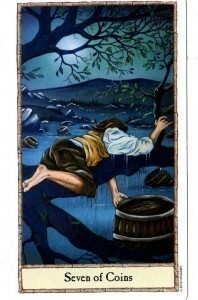 Think of card 2 as the Devil or Temperance. 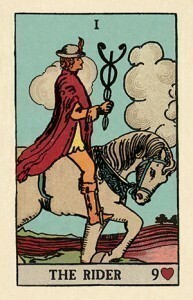 That card may show you whether you need to face down your own Devil or embrace your already moderate lifestyle. Feel free to share your responses. Tag us on Instagram if you share it there. This entry was posted in Uncategorized and tagged TarotBlogHop on August 1, 2016 by USGS Staff. 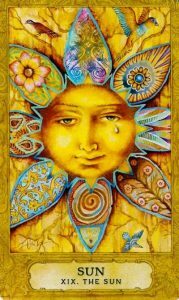 Welcome to the 2016 Summer/Litha Tarot Blog Hop. Our wrangler, Morgan Drake Eckstein has asked us to create a card. We would love to show you a peek into some of our artists’ processes but we have too many to choose from. Instead, we will just show off some cards from some decks. We can’t show them all but here are a few we love. 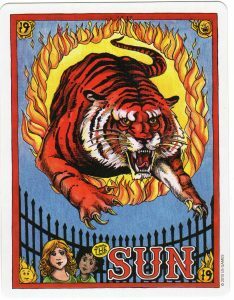 We are using the Sun card since it is officially summer today. This entry was posted in Uncategorized on June 21, 2016 by USGS Staff. 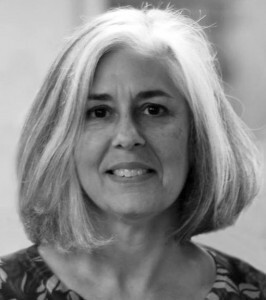 Why none other than our very own Lynn Araujo who was interviewed by the American Tarot Association for their monthly Reflections. 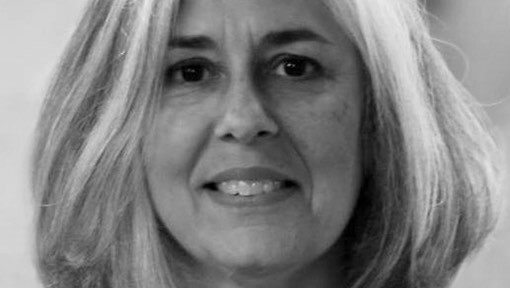 Find out which deck Lynn wishes USGames had gotten. Learn a bit about her background and what she did before she came to USGames. 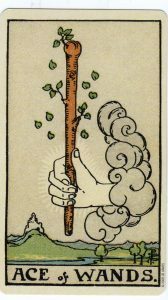 This entry was posted in Announcements, USGS Company and tagged American Tarot Association, ATA, lynn araujo on April 4, 2016 by USGS Staff. How do you use the Tarot in relation to matters financial? Do you make a living from it? Do you sometimes have a sneaky peek to help you pick lottery numbers or have a flutter on the gee-gees (and have you had any luck)? Do you take the risky path of advising others on financial matters or is filthy lucre a no-go area? 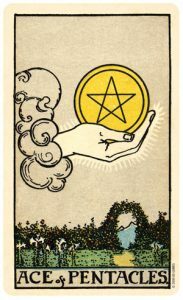 Is it just the Pentacles for money matters or do you associate other. less obvious, cards with this area? 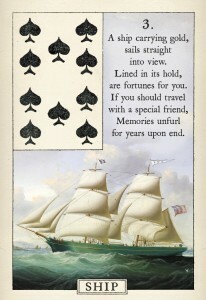 For our contribution, we thought we would offer up some Lenormand money cards. 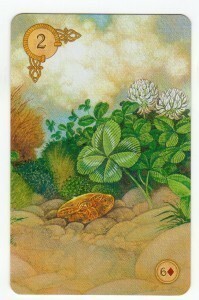 In the category of small money and small luck, you have the Clover (2). Next would be the Ship (3) which carries a meaning of investing. It can point to money coming in from a foreign land as well. The Bear can be seen as your personal finances. It has a meaning of luck in your money. The Mice, however, are not lucky. They chew and gnaw things so when you see the Mice someone or something is nibbling away at your finances. 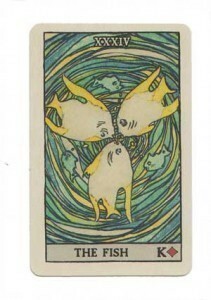 But the Fish swim back to prosperity and lots of it. Here is your Bill Gates type fortune. 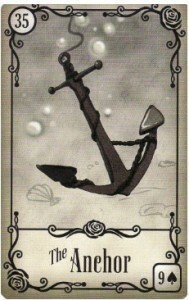 Finally, the Anchor is the card that indicates your financial stability. 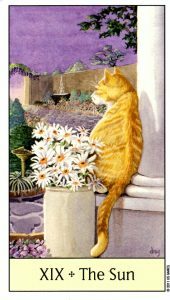 We hope you have enjoyed our Lenormand money cards. Leave us a comment then hop to the next blog. 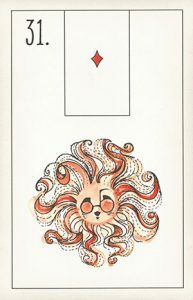 This entry was posted in Decks and tagged lenormand, Tarot Blog Hop on March 20, 2016 by USGS Staff. What a lovely saying from our wrangler, Joy Vernon. Joy tasked this group of bloggers to discuss this subject. She gave us some ideas and her own thoughts on the subject. We thought we would share two new books that show this idea of awakening the heart in action since writing does involve being still so your heart can awaken. We think both books are great examples of this process. How about you? 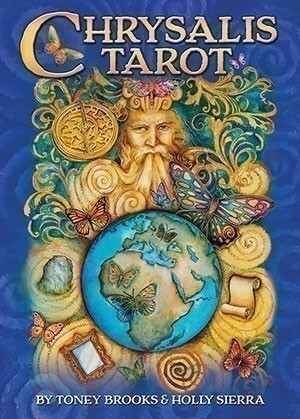 First up is the brand-new Chrysalis Tarot book from Toney Brooks with art by Holly Sierra. 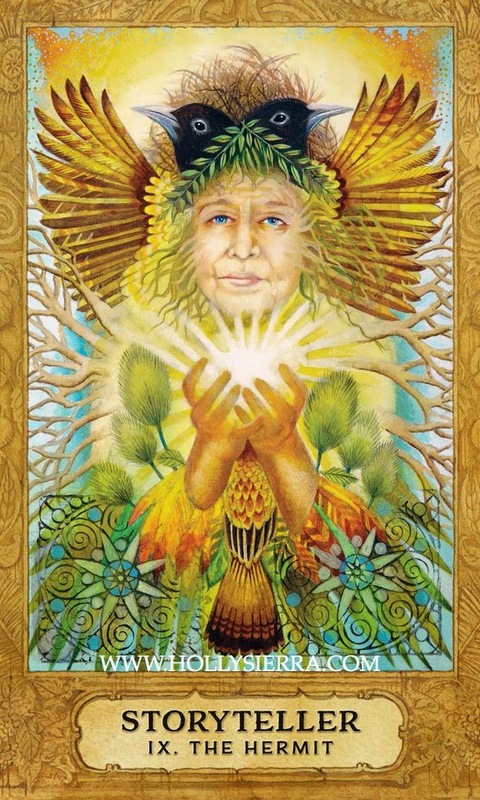 This illustrated companion book to Chrysalis Tarot explores the spiritual journey of self-discovery and transformation that leads to higher consciousness. Part I examines the magic and energy of the Otherworld that guides you on this journey. 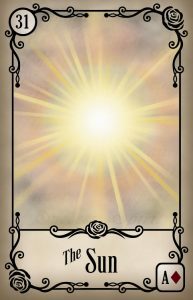 Each of the five chapters focuses on a character from the Chrysalis Tarot illustrated with an original sketch by Holly Sierra. Toney Brooks relates wisdom from New Physics, the Collective Unconscious, archetypes, healing, and chakra work. 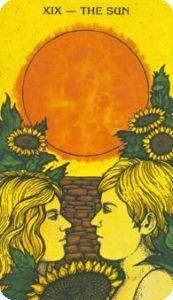 Part Two of this book expands on the interpretations of the 78 cards. In addition to Toney’s insightful descriptions, Holly shares the inspirations for her Chrysalis Tarot artwork and presents her original black and white sketches for each card. 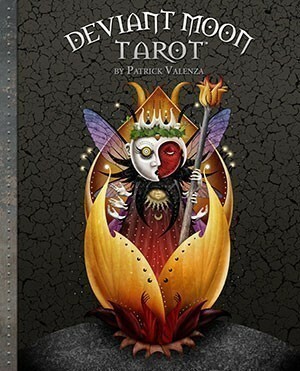 Next is a personal journey into the Deviant Moon Tarot with Patrick Valenza. 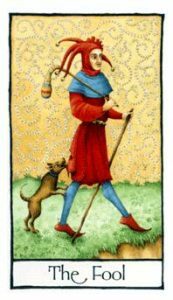 In his Deviant Moon Tarot book, Patrick takes us on a personal journey from his childhood drawings to the finished Deviant Moon Tarot. Talented artist Patrick Valenza presents uniquely alternative interpretations of traditional tarot with symbolism inspired by childhood dreams and visions. 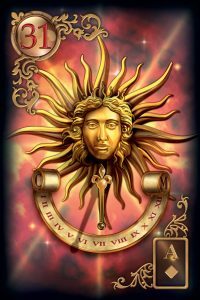 This fully illustrated book takes you behind the scenes of Deviant Moon to glimpse the creative inspiration and artistic technique that gave rise to this popular tarot deck. 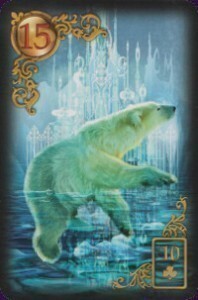 Patrick also offers expanded meanings and interpretations, for both upright and reversed card positions. 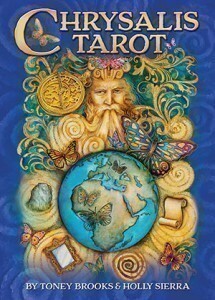 Two very different visions of Tarot brought to you in deluxe, hardbound format to enjoy throughout the years. Which will you get first? 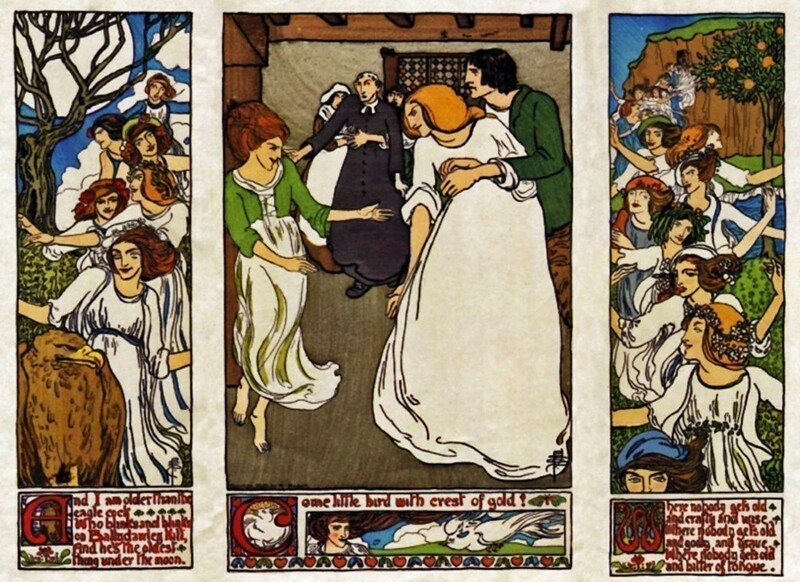 We can’t think of a better person to commemorate than artist Pamela “Pixie” Colman Smith. 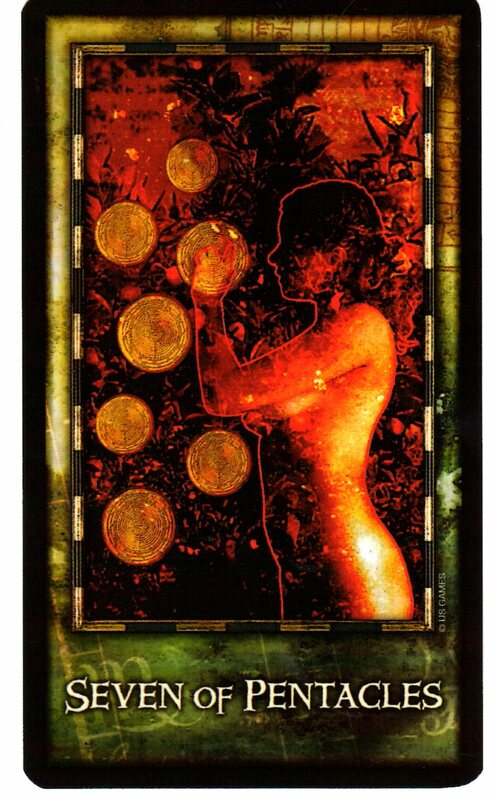 Her art work has become the iconic representation of the Tarot for the world. 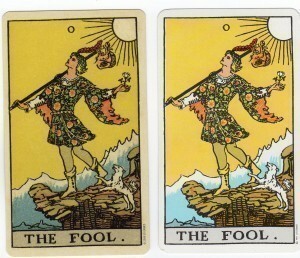 When you think of the Fool, the first image that comes to most of us is her Fool. Pixie’s story is a sad one as she died in relative obscurity. But her life was filled with amazing people. 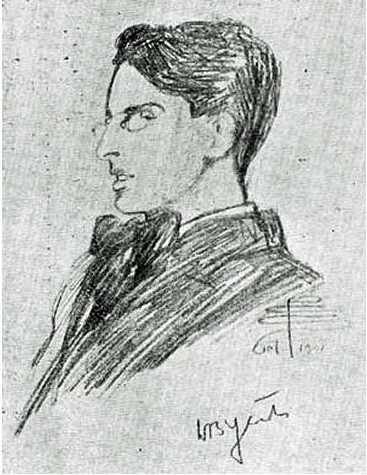 She was mentored by Alfred Stieglitz (he was the husband of Georgia O’Keefe). He featured her work in his New York gallery. She knew actresses, actors, poets, artists and more. Her life was filled with eccentric, interesting people. Pixie did many sketches. Here’s a sketch of poet William Butler Yates that she did in 1901. 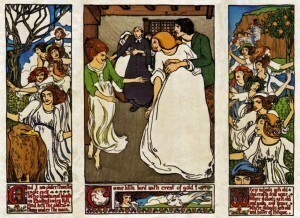 In 1898, she had an illustration published for Yeats’ poem “The Land of Hearts Desire” which was part of _The Illustrated Verses of William Butler Yeats_. 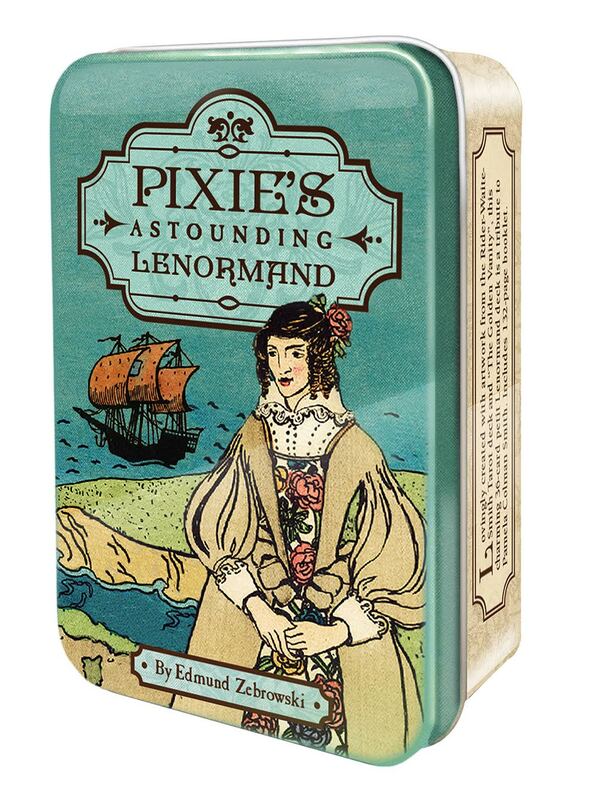 And her legacy continues with the new Pixie’s Astounding Lenormand. 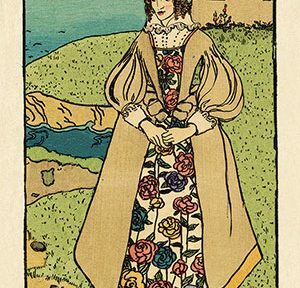 Lovingly created with artwork from the Smith-Waite® Tarot deck and “The Golden Vanity”, this charming 36-card petit Lenormand deck pays tribute to Pamela Colman Smith. It includes a 132-page booklet. How has Pixie’s work influenced your life? 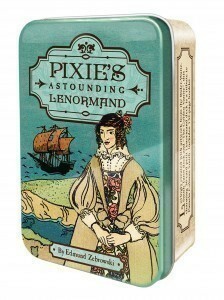 Leave a comment answering that question to be entered into a drawing to win your own Pixie’s Astounding Lenormand tin. Get extra entries when you share this post on any Social Media using the tag #astoundingpixie . Just leave a comment letting us know where you shared it. Happy Halloween! May you get more treats than tricks. 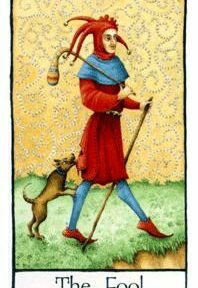 Now hop off to the next in our Tarot Blog Hop. Don’t forget to share this post to win the deck. 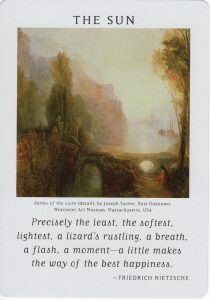 This entry was posted in Authors and Artists, Decks, Giveaways, Lenormand, Tarot History on October 31, 2015 by USGS Staff. Our blog hop leader is Aisling. She asked the group this question. 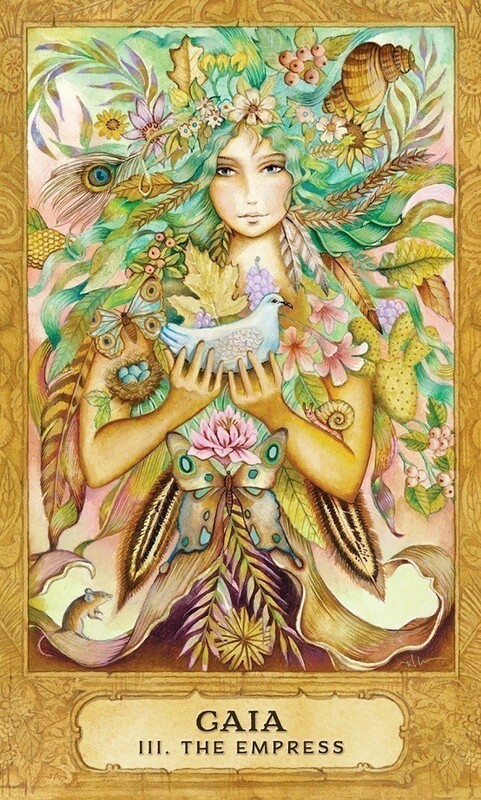 “What does Mabon/the Autumnal Equinox/the Second Harvest mean to YOU?” Her challenge was to choose the card that means this harvest to us then create one. Since we are in the business of publishing decks, we will let some of our creative deck makers speak for us in the form of cards. We thought about harvest and what that meant. 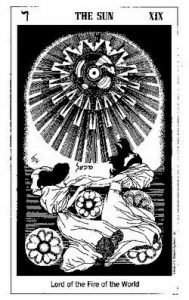 The card we chose to represent our thoughts about the second harvest is the Seven of Pentacles. 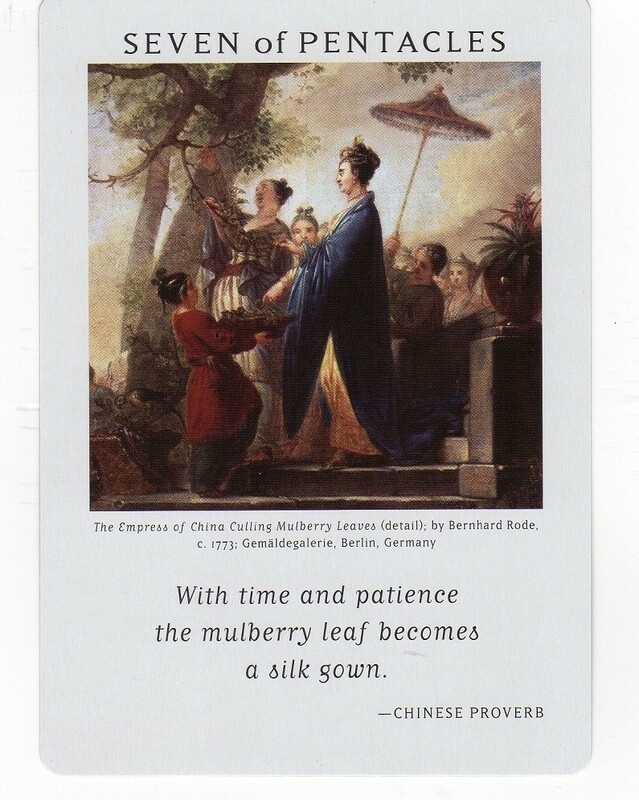 The theme of this card is often about pausing in the middle of work. It’s a card about regrouping and regathering your energies. Since there are traditionally three harvests, we thought this one would represent the Second Harvest nicely. 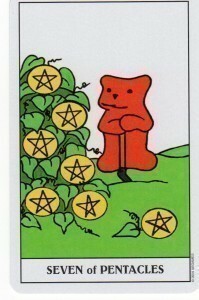 The Japaridze Tarot uses Gardens for the Pentacle suit. In the Art of Life Tarot, we see a lovely painting plus a quote to remind us about rest and work together. 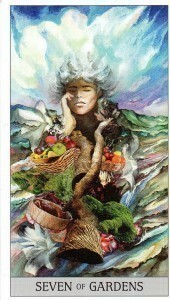 Here is a woman reviewing her harvest in the Archeon Tarot. 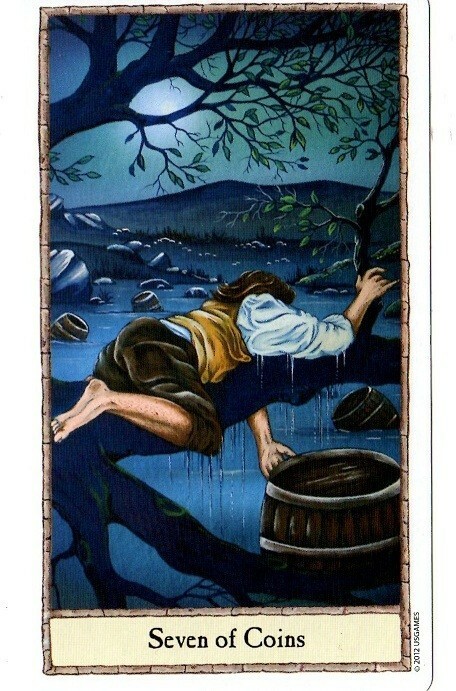 Of course we need at least one hobbit to show up–The Hobbit Tarot. 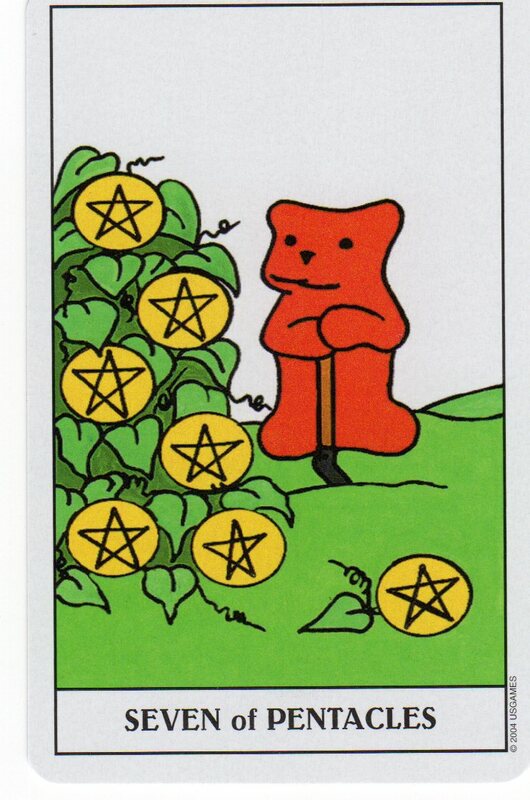 Our little bear is trying to figure out which is the best coin to harvest in the adorable Gummy Bear Tarot. 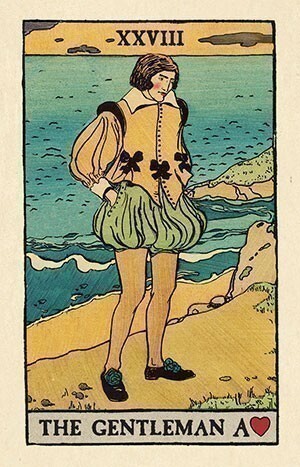 Of course we have to have at least one representative from the marvelous Visconti-Sforza Pierpont Morgan Tarocchi Deck. We hope you have enjoyed this journey through some of our decks. Please join is for our daily question of the day. And check out our Pinterest boards too. Now hop on to our neighbor. Remember to leave a comment so we know you were here. Just tell us your favorite card from this post. 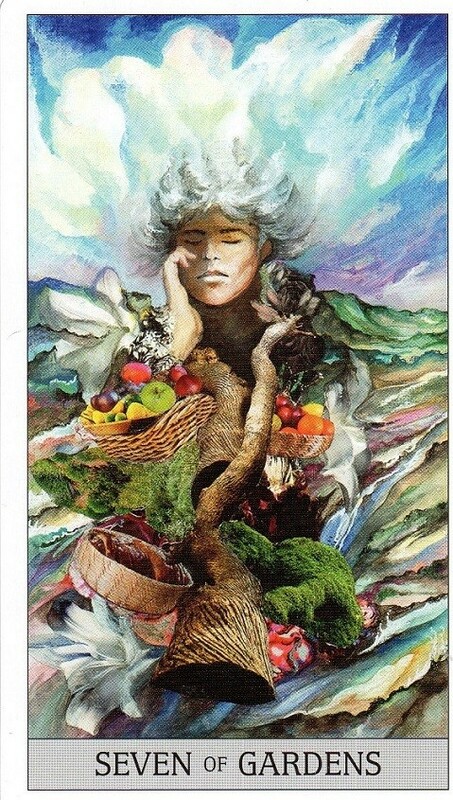 This entry was posted in Decks and tagged TarotBlogHop on September 20, 2015 by USGS Staff.